Note: I wanted to break up this post into two parts. I had thought about making two separate posts, but I figured it would be a bit confusing. Part I is a personal reflection on the marathon and the inspiration of the event as a whole and the response of people today after the blast. Part II is about the media response and the irresponsible speculation by journalists to fill air time and drive ratings and social media metrics. I've written this so the first part is standalone, because not everyone is going to be in the mood to read about issues with today's media after such a tragedy. Having grown up in the Boston area, and spent a decent amount of time on and around Boylston Street in high school, today's events at the marathon have hit close to home, to use a bad cliche. Patriots' Day is a special day in Massachusetts - a day off that most of the rest of the country does not get. Everyone who grew up in and around Boston can remember heading down to the marathon route to cheer on the runners as they go by in droves along the grueling 26.2 mile course. 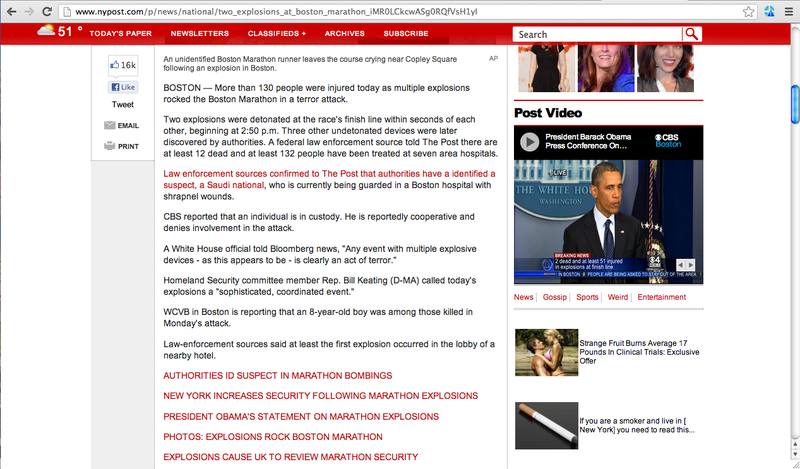 Today's bombings will change the marathon for the foreseeable future. The openness and carefree vibe of the event will revert to a more closed and tense atmosphere next year and possibly for years to come. For an event with such a rich and vibrant history, from the revolutionary to the bizzarre to the inspirational, the fact that the marathon will forever be tainted with this tragedy is a shame. Through all of this sadness and anger, watching the video of the scene right after the blast is inspiring in a way. It is inspiring because you see people rushing to the site of the blast, not knowing if there are any secondary devices waiting to take out first responders. 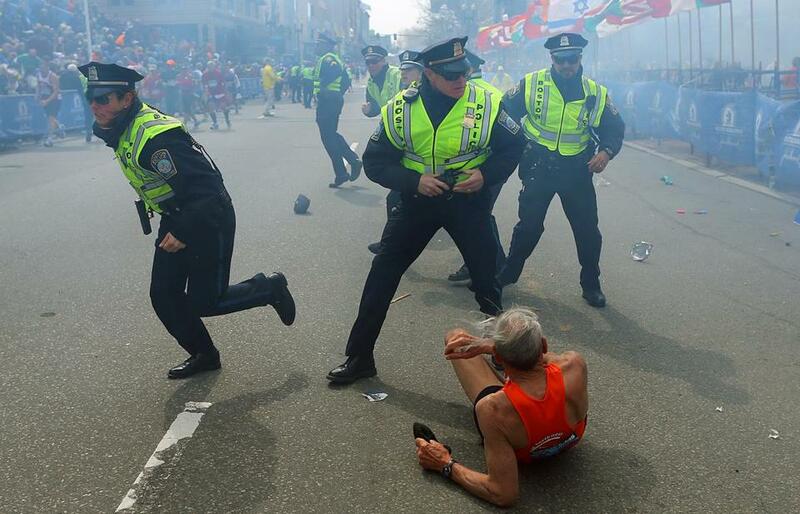 It is inspiring to see cops, EMTs, firefighters, BAA volunteers, and runners working together to tear down barricades and get to the injured. Other stories of heroism and kindness coming out of the city do not replace the anger and fear and confusion that follow something like this, but it certainly helps to begin to displace them, which only time and reflection can do. Unfortunately, in contrast to the heartwarming response to such evil, is the ridiculous speculation by media outlets. The Post reporting that a suspect is in custody and 12 people are dead (neither of which are confirmed true at the time of this writing and the latter having been reputed by BPD Commissioner Ed Davis multiple times). 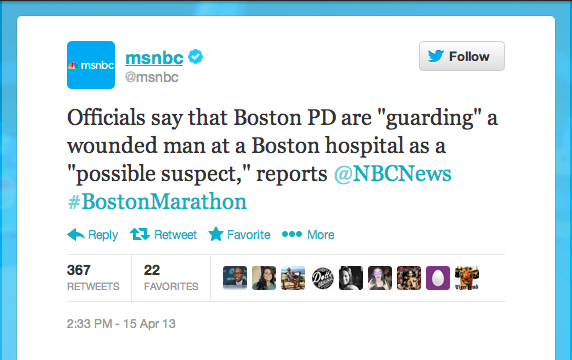 MSNBC jumped on the suspect bandwagon as well. This is just sloppy journalism with shoddy "sources." On top of this, there is just wild speculation that has no business in a journalistic environment. I wasn't watching CNN, but from what I heard about Jane Harman she was just spewing speculation with zero basis in fact. Also Luke Russert thought that because he went to a Red Sox game twenty years ago when Waco happened that there could be a link to the marathon bombing. Let me be clear about this: this could be an AQAP bombing. This could be a home-grown domestic terror bombing. If either scenario is true, Harman or Russert deserve zero credit for saying it on air/Twitter. Their speculation adds nothing to the fact finding that occurs after something like this, it adds nothing to the national discourse, and really only muddles what is going on and further confuses people. I understand there's a drive for ratings and retweets, to be the first to break a story, but that should never supersede journalism. Ever. In times of tragedy like this there is a human drive to get the facts, to try to make sense of something like this in our minds. We need to see a cause and effect so we can prevent something like this in the future. Unfortunately, rationality and logic are far removed from an event like this and it simply does not make sense. Speculation with no factual backup to try to make sense of it is unfair to both the speculator and the speculatee. We look to the news for information and updates, not ratings-driven false scoops and made-up connections.